Since first announced, the Senior Ball fixtures for the upcoming 2019 season have been subject to 22 changes. Tamworth Phoenix are the team with the most changes, shifting 3 of their fixtures to Saturday kick offs. The Farnham Knights have flipped their Home and Away fixtures with the London Blitz and moved their home game against the London Olympians out by a month. 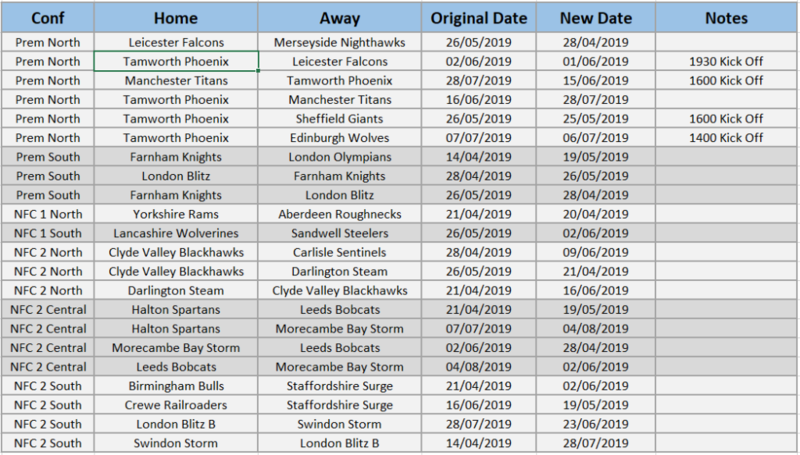 These changes mean that the Knights play 6 games on the bounce having already played the Warriors and Blitz in their first 2 opening fixtures. The Blitz are another team who Prem North playing 6 games on the bounce. The same goes for the East Kilbride Pirates in the NFC 1 North. There are a few other examples of teams playing a lot of games in quick succession, it will be interesting to see how this aggressive scheduling affects player availability through potential injury and also if this will have a knock on affect on results. To accommodate these changes further, our graphical fixture schedules have been updated, and can be found at: https://gridironhub.com/pulse/2019-senior-ball-schedules/.